It’s not that I don’t have enough WIPs. It is just that I love fall, and especially October, and so I couldn’t help but be a sucker for the name of the KAL: Socktoberfest! Not to mention that I’ve had a few pairs of socks on my to-knit list for awhile. So I’m in. I’ll be using this opportunity to knit some fall-colored socks. 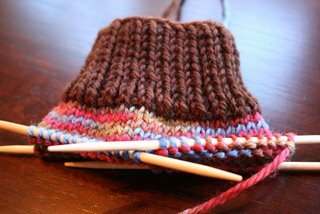 First up will be a pair of socks for my friend T. I promised her last spring I’d make her a pair. I’ll be seeing her in Italy next month and I want to either give them to her then, or have mailed them to her before we both leave. 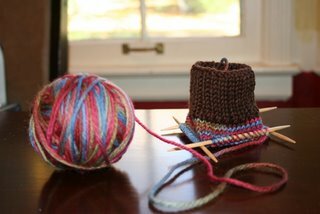 I’m doing the cuff and toe in Lorna’s Laces in Chocolate, and the rest of the sock in Lorna’s Laces in Tuscany (fitting, no?). I love, love, love both these colorways. 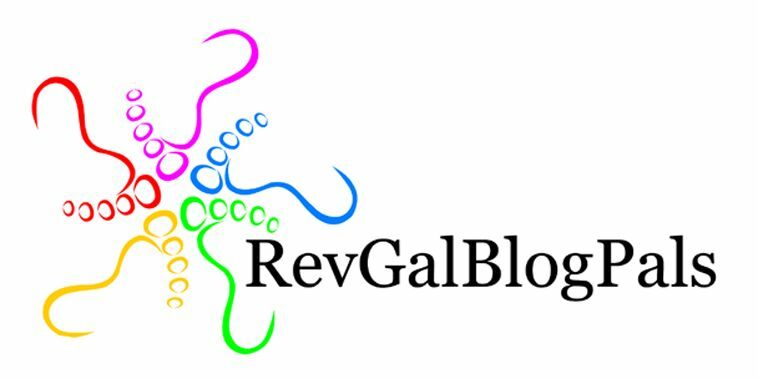 Lolly has posted a little Socktoberfest questionnaire for participants. So, here it is. My first pair of socks were in February of this year – they were my Knitting Olympics project. I had no idea how quickly they would go, and I finished them well ahead of schedule. I used Knitting Pure and Simple’s Basic Women’s Socks Pattern, and just followed the directions. Is that teaching myself? I think I probably referred to Silver’s Sock Tutorial to make sure I was doing it right. My first pair was a basic, worsted weight, stockinette women’s sock, done in Malabrigo (my first Malabrigo, in Indigo). They were a birthday gift for our administrative assistant, so I have no idea if they have “held up.” I do know now that I probably shouldn’t give non-knitters handwashable socks. It just seems a little cruel. See above. The whole handwashable versus machine-washable thing is something I’ve always struggled with when it comes to gifts. But ever since I fell in love with Lorna’s Laces, the question is settled, at least when it comes to socks. As long as I’m willing to give someone an expensive pair of socks! Lorna’s Laces. My favorite yarn for socks. Actually, it would probably be one of my favorite yarns for just about anything, but I have only ever used it for socks. Eh? Crochet socks? I can’t even really get my mind around that idea. In terms of how I knit them, I’m pretty basic. I do my socks on dpns. Have never crocheted them, done them on 2 circs, or tried Magic Loop. I’ve only ever done a flap, so for now that’s what I prefer. Again, I’m kind of basic when it comes to socks. I have made 4 1/2 pairs. The 1/2 is the ugly orange sock that I so far can’t bear to make a match for. In addition to my first pair in Malabrigo, I’ve done a pair for my dad in Cashmerino, a pair for my galpal CJ in Lorna’s Laces, and a lacey pair for myself in Louet’s Pearl. I also started a pair of fall socks for myself in Lorna’s Laces (chocolate – mmmm), but I frogged three different times after not being completely satisfied with the look (was trying different things each time). I’m currently using a little of the chocolate Lorna’s Laces for T’s fall socks (above). Turns out that even though my Mac won’t recognize my printer for printing purposes, it does recognize it for uploading pics. Hence, the pics in this post. I finished my second pair of Felted Clogs. No pics because, frankly, once you’ve seen one pair of basic felted clogs, you’ve sort of seen them all. Neither of my boys has any interest in either pair of felted clogs. I’ve forced myself to start seaming the cardigan. I’ve got the sides done and one sleeve. Yup, it’s gonna be too tight. And too short, too (though it’s supposed to be, but it’s just not my best look). I’m really aggravated that I’ve spent so much time on something that isn’t going to work out. I’ve learned not to eat chicken that’s been in the refrigerator for a week. I learned that on the hard way. Today is a perfect October day. So I’m heading out now with My Old Man and the boys to a local cider mill for cider and doughnuts, an afternoon in the autumn sun, some time for the boys to kick around in the leaves, and, I hope, a few fall pictures. I hope wherever you are, the October sun in shining and you have time to enjoy it, too! I haven’t tried Lorna’s Laces yet–I’ll have to look into that! Do you think you can block your sweater a bit bigger? I hope you can use it somehow! A fall trip to the cider mill sounds so lovely. Too bad we don’t really have fall here in Houston (er, I guess we do, it just starts in December). Those colors look great together! I have 4 skeins of Lorna’s in my stash and I adore them – I can’t wait to use it! I hope you can block the sweater so it is bigger. I love the idea of combining solid yarn with variegated yarn! Ooh, I bet if you (meaning “one”) did short-row heels and toes you could also do those in the solid color and that would look cool too. But that’s neither here nor there. Yours look great!